Ansonia Clock Co., Royal Bonn "LaNord", ca 1904. This case islarger than average at 14-1/2 inches wide, and almost 12 inches high. Colorsare outstanding and primarily in pastel shades of blue, green, yellow, roseand the usual spattering of gold highlights. The movement is 8 day, halfhour gong strike; visible escapement dial is 2 pieces. Slight dial damagearound the strike side winding arbor, and faint hairlines in a couple ofother places. Heavy beveled glass, French sash. You may note white linesbetween the two flowers. They are like stretch marks and are the result offiring the porcelain when the clock was made. It is not damage caused byan owner of the clock. 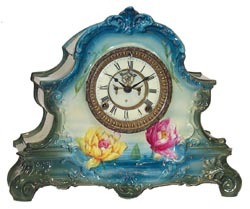 The clock is very nice and regularly brings up to$1500 on Ebay or other auctions. Ly-Ansonia No. 2584.